This Superman Distressed Vintage kids youth T-Shirt. Our favorite superhero is back... and better then ever! 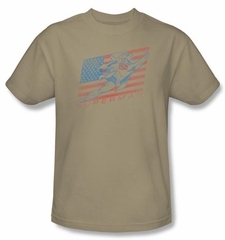 This awesome superman distressed logo vintage tee features a worn style superman in front of a American Flag. Available in Small(6-8), Medium(10-12), Large(14-16), & XL(18-20)!